These simple dolls date back the the heads for the bunraku puppets. Many are made from the wood of paulownia (tooso ningyoo 桐塑人形 ). The wood is made to powder (kiriko 桐粉) and then kneaded with natural glue. When the form is done, it is whitened by layering it with gofun whitewash powder. Finally the colors are added. 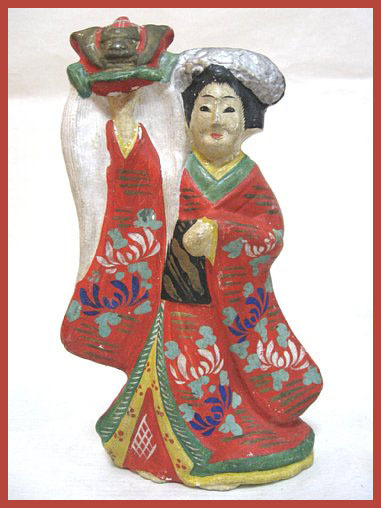 These simple "dolls" where quite popular in the Edo period and made in many parts of Japan. Children could play with them and dress them up as they liked. The heads of traditional puppets are carved by specialists, while the bodies and costumes are often constructed by puppeteers. The heads can be quite sophisticated mechanically. 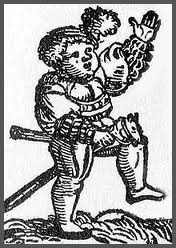 In plays with supernatural themes, a puppet may be constructed so that its face can quickly transform from a nice lady into that of a fearful demon. 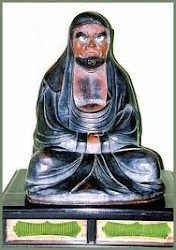 Less complex heads may have eyes that move up and down, side to side or close, and noses, mouths, and eyebrows that move.
. Painting by Gyumei San .
. Horseheaded Kannon (Batoo Kannon 馬頭観音) . 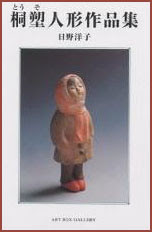 The word "Kubi-ningyo" (neck doll) refers to the little doll or animal heads of clay (the oldest ones were likely carved from wood) on a bamboo stick. The animal type are offered at the tutelary shrines to guard children against intestinal worms, night crying and coughing. 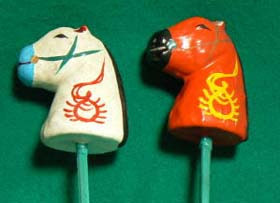 These animal heads often represent the twelve Zodiacal signs. 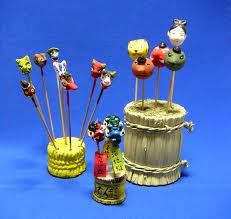 The Anesama kubi ningyo are doll heads on bamboo stick and are used as toy dolls. The girl may wrap bits of cloth or paper around the stick or she may insert the stick end into a homemade body. 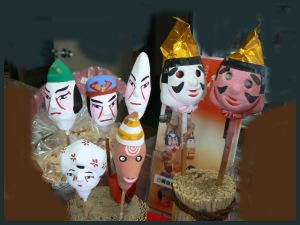 There is an amazing resemblance between Kubi Ningyo and small Awaji rod puppet heads used by itinerant puppeteers in rites to ward off evil spirits, illness and misfortune. 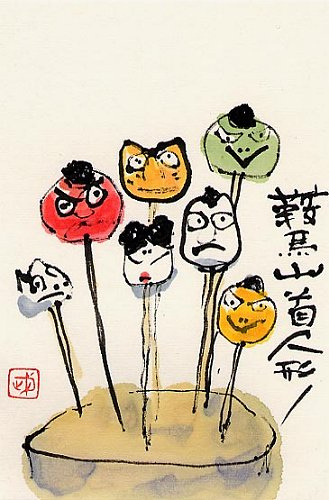 Lea Baten points out that Kubi Ningyo were sold as potent souvenirs of an Awaji rod puppet festival or ceremony.
. fûzoku ningyoo 風俗人形 dolls about manners and customs . 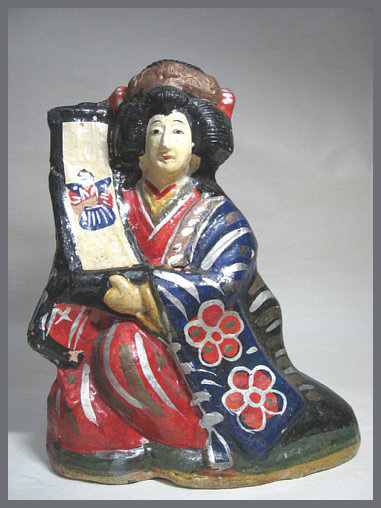 They are made in many parts of Japan, with motives of old legends and regional heroes. The heads are made of paper, with a string attached to move the head or eyes, or stick the tongue out. Many of the anesama dolls can be dressed. About the many folk tales of Tono in Iwate, including the water goblin Kappa and the girl ghost 座敷わらし zashiki warashi.
. otogibanashi dorei おとぎ話の土鈴 clay bells with motives of legends .
. Ryuusenji no kubi uma 竜泉寺首馬 horse head from temple Ryusen-Ji .
. Nakayama no kushi ko anesama 中山の串コ姉様 elder sister dolls on a stick .
. Shitakawahara yaki 下川原焼 clay figures .
. Shimofusa kubi ningyoo 下総首人形 head dolls .
. Haramachi odoke 原町おどけ funny head dolls .
. Hanamaki kubi ningyoo 花巻首人形 head dolls .
. Satsuma kubi ningyoo 薩摩首人形 head dolls .
. Kurama kubi ningyoo くらま首人形 head dolls .
. oboko おぼこ head-doll .
. Noroma Ningyo 野呂間 puppets of simpletons .
. ichibun ningyoo 一文人形 head dolls with one letter .
. kideko, ki deko 木でこ head made from wood / 大友人形 Otomo dolls . .
head dolls made by Ichiron san .
. Awa kubi ningyoo 阿波首人形 head dolls from Awaji Island . 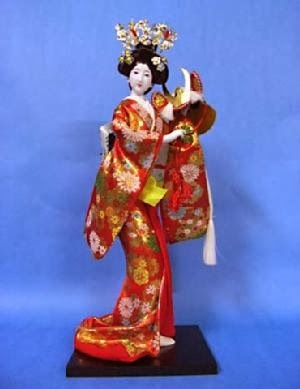 Yaegaki hime is a figure from the puppet theater, later Kabuki. She was the daughter of the famous lord Uesugi Kenshin . In Kabuki, she is daughter of Nagao Kenshin and falls in love with Minosaku, who looks like her fiance Takeda Katsuyori (who is in fact Katsuyori, who is alive). 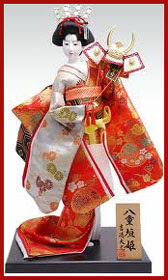 The standard costume for hime (princesses) is a furisode (long-sleeved kimono) with matching uchikake (long outer garment) embroidered with various patterns such as the flowers of the four seasons, the shapes of clouds, or fans scattered on running water, using gold and silver threads on red fabric for both layers of the costume. This costume set is called "Akahime," which has also become the common name of the princess role. Red color represents the cuteness and innocence of the princess.
. . . CLICK here for Photos of other dolls ! princess Yaegaki. The princess is the heroine of a five-act drama named Honcho Nijushiko, the 24 models of filial piety. This historical drama was first performed in 1766 as a – Bunraku (文楽) – traditional Japanese puppet theater also called Ningyō jōruri. 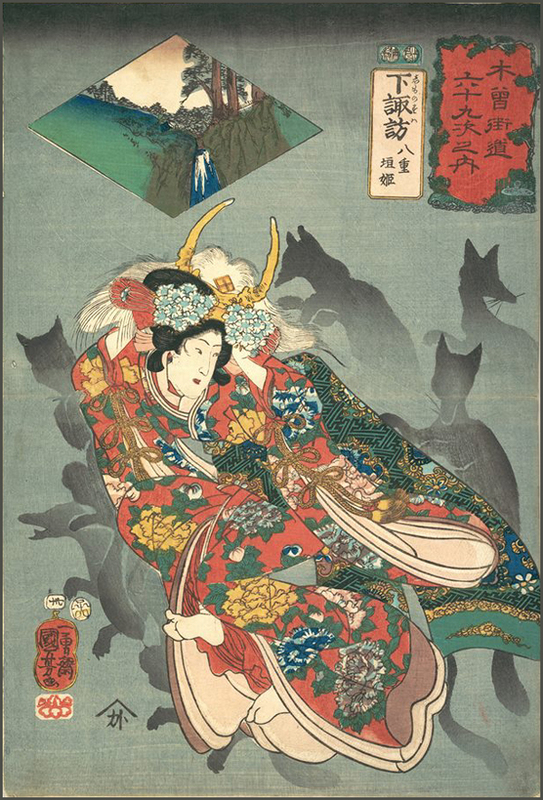 .... At the end, possessed by the mysterious power of the helmet and guarded by two white foxes, Yaegaki-hime sets out to pursue her lover across the frozen Lake Suwa and flies off to Katsuyori. Katsuyori was saved, Takeda and Kenshin made peace and Princess Yaegaki and Katsuyori got married and live happily ever after.